A beautiful 1972 Campervan originally all the way from Texas, USA. 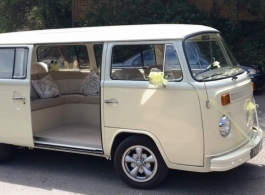 This retro classic VW is a Bay Window model in Cream with a White roof and is capable of carrying 5 - 6 passengers or just the stars of the show (bride & groom). Chauffeur driven and inclusive of your colour choice of ribbons and a Champagne stand & glasses - this is a really cool mode of wedding transport that will look brilliant in your wedding day photos.